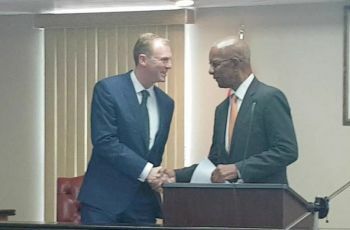 ROAD TOWN, Tortola, VI- Premier and Minister of Finance Dr The Honourable D. Orlando Smith (AL) today November 13, 2017 in the House of Assembly, while responding to a question from Opposition Member Hon Julian Fraser RA (R3), called reports written in the international media that Governor Augustus J. U. Jaspert was hailed as a hero, Fake News. The report written in the Express, a United Kingdom news outlet, claimed that Governor Jaspert is a hero as he single-handedly took control of the post Hurricane Irma situation as the local Government of Premier Smith had collapsed. The article was published on September 10, 2017 with the author being a Marco Giannangeli. It said sources reported how in Irma’s aftermath Governor Jaspert single-handedly took control of operations due to the breakdown of local government. “Gus is being viewed as a bit of a hero,” the article quoted one unnamed source as stating. “Local government has collapsed and he has been forced to take over on his own. “He has rolled his sleeves up and has personally directed operations,” the source said, according to the United Kingdom Express Newspaper. However, today Dr Smith scoffed at the article and said to Hon Fraser when pressed that it was ‘fake news” as this did not happen. He said he was side by side with the Governor and invited him to Cabinet meetings where decisions were made. However, many residents have criticised the National Democratic Party Administration as there was no communications from the government until about a month after the two killer storms Irma and Maria. Weeks after they appeared on a local radio station and began flooding the airwaves with press releases. But they were very much absent about three weeks immediately following the storm. 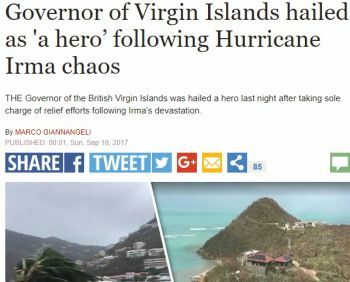 Hurricane Irma left the Virgin Islands battered, with people in the streets desperate for food and gasoline, along with widespread looting on Tortola, Virgin Gorda and Jost van Dyke. 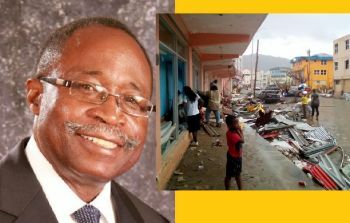 He stepped up when it was needed, NDP hid away, hero or not he is probably the most liked Govenor the BVI has ever had. The hero were the three district representatives we saw: Marlon, Andrew and Mitch. Andrew Fahie is the only hero! Stop spreading fake News. NDP must go. This country needs real leadership. Governor Jaspert is a hero for the BVI and I am very proud of him. He took matters into his hands under the State of Emergency and handled it well though tense at certain press conferences and video releases. Dr. Orlando "zzzzzz" Smith and his NDP government was AWOL FOR 3 WEEKS. At times we have to put like and dislike aside and be honest and chose the best person for the Job. At this present time with these challenges. Frazer is the best man to lead us out of this situation and put us back onto our feet.. All the rest are too corrupt, Greedy and weak... A lot of us may not like frazer but if we are honest.. Frazer is the only one who can stop us from sinking.. Foreign companies knocking locals and belongers about, with distespect and disregard.. Our utility services are poor and dont care.. Under Frazer these will get fix quickly and better will come. I believe it w with all my Heart.. Governor Jaspert your the British Virgin Islands hero welcome home, thank God for you. For we couldn't pull thru this with out your guidance. We love you. God blessed you and your family and the people that made up the BVI. Does a prophet has honour in his own town? Of course, some are still beholden to Mossah. Either Doc isn't care about us or he is very stubborn, naive or a weak leader. So long the people asking him to switch up the ministers try something different to stop us from sinking. He continues to allow us to sink deeper and deeper. I Respect Doc so much. I'm so disappointed... Labour ..agriculture..Culture...Finance.. Failing us badly.. These ministries need switching up Doc... My God.. Have mercy..
my question is when is the date for the UK to take over? 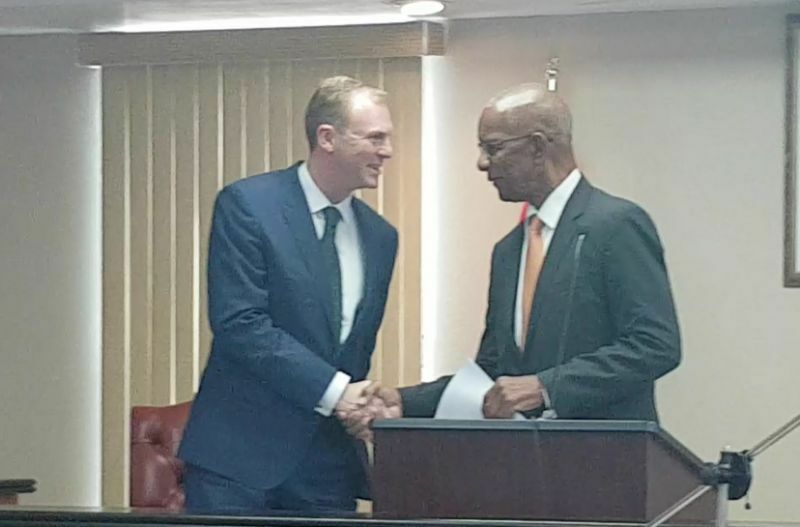 Governor Jasper you are a hero and you deserve that title I have watched you work hard indeed and after the passing of those hurricane you showed the BVI something no other did I saw the human in you the parent in you I saw leadership in you and I thank you. You were more than our governor you were and still is your hero your showed the people what you were made of by being a parent to our children out their in the school doing work without media around you give kids hope when our other leadership were a wall I commend you highly for your strength courage and bravey. You deserve to re-welcome the right way you showed our people that you care that we deserve to looked after your our hero and your work spoke for itself we love you and we welcome you, you are indeed the a hero. Once a "State of Emergency" has been declared the Governor was required to take charge. His Excellency and government did a wonderful job and the Premier had to be kept informed throughout that period. Now what I don't understand is how (according to this article) the Premier could say he invited the Governor to Cabinet meetings. The Governor is the chairman of Cabinet so the Premier can't invite him. The struggle for and seemingly envy over the power the Governor is very evident. The Premier has a job to do and so does the Governor. Being new to the Territory and having to deal with the biggest disaster we have ever faced I congratulate the Governor on a job well done. Good gracious, the man Doc just jealous he failed we the people again!!!!! . According to the constitution, the Governor is given power under the circumstances athand. 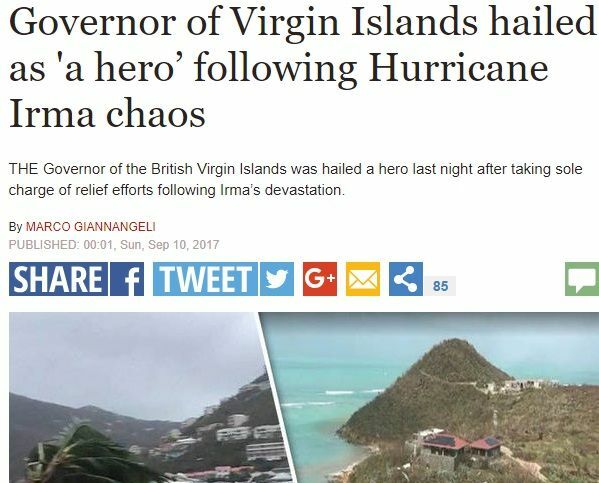 We had a major disaster that impacted the BVI and the Premiere should learn to be humble. There is nothing wrong in what the Governor did. The Governor foremost has a responsibility and he did a very good job. Thanks Governor!!!! Governor will be a better hero if he get rid of ndp dumb dumbs!!!! All this party could do is talk talk talk, bribe bribe bribe, promise promise promise, manipulate manipulate manipulate theif theif theif. Get rid of thrm. The whole ndp party. Useless pricks!!!! They have no damn place and no damn sense!!!! Get rid of them!!!! Forget the white envelope!!!! Get rid of them!!!! !